So, you’ve recently decided you want to make your own candy. Great! We’re so excited! Making your own candy is a rewarding and delicious process, and it’s sure to be a hobby your friends, family, neighbors and coworkers will love! Like any new hobby, though, making your own candy can be a little intimidating. Where do you start? What skills do you need ahead of time? What kind of tools will you need to do it right? At Sweet Treat Supply we like to help anyone take up this delicious new hobby, so we’ve created the ultimate guide to essential supplies for beginner candy makers. Candy Thermometer — The most important tool in your arsenal will definitely be a candy thermometer. Many candies require just the right temperature to set perfectly, so find a thermometer that will hook on to your candy-making pans for accurate measurements. Depending on the types of candies you may decide to make, there are two different candy thermometers you might need: a classic one, such as this Taylor Candy Thermometer, or a Chocolate Tempering Thermometer for chocolate-based candies. Candy Molds — While it’s possible to make candy without candy molds, it’s pretty difficult to get that perfect shape you’d want. When you’re first starting out, choose two or three different shapes that you think you’ll use time and time again. You’ll likely want to add to your collection as you become more skilled, but having a few different shapes to use while you’re starting out is a great strategy. Additionally, be sure to consider whether you’d want hard candy molds or flexible ones, which are typically used with chocolate and other softer ingredients. Candy Funnel — This tool might not immediately come to mind when you think about candy making, but it’s sure to save you on cleanup after your candy is made. Candy funnels allow you to disperse the perfect amount of candy, ideal for pouring into molds. We highly recommend this one-handed candy funnel made specifically for chocolate melting wafers. Chocolate Melting Wafers & Candy Melts — It would be difficult to make candy without the main ingredients, so make sure you have plenty on hand. If you plan to make chocolate candy, you’ll want chocolate melting wafers or disks, which come in a variety of types and are especially easy to temper. Candy melts can be used as a main ingredient in a candy or as an easy coating. Isomelt Crystals — Isomelt crystals are an easy sugar substitute for hard candies. We love using them because they offer a lot of control over the candy’s final color, don’t have as many calories as sugar and are super simple to use in hard candies. Candy Writers — Sometimes, your treats will deserve a little extra decoration, whether you’re planning to write letters to spell out the birthday girl’s name, draw bunnies in time for Easter or decorate just because. That’s where candy writers come in! These look a lot like icing tubes and come in a wide variety of colors, giving you total control over the finished product! 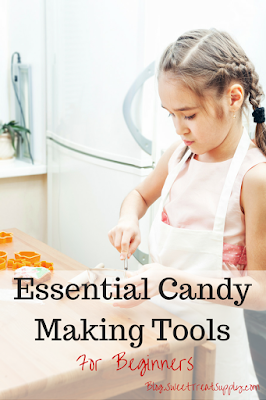 Do you have any other questions about how to make your own candy? Let us know in the comments below and we’ll do our best to help you!